All of Pest Solutions 365’s pest control work is covered by warranty and performed by professional exterminators who are certified, bonded, insured and qualified to eradicate pests and termites from your home or business. Pest Solutions 365’s professional exterminators undergo years of education and training, making them among the most qualified experts in pest control and termite control. The key to Pest Solutions 365’s pest control and termite control success is its use of Integrated Pest Management (IPM) practices. IPM combines a combination of steps to achieve long-term pest control solutions. IPM practices guide Pest Solutions 365’s pest exterminators in anticipating and preventing pest activity and infestation. Our standard pest control and termite control services include several steps. Inspection: We will inspect the entire structure of your home or business to determine the pest species and what types of damage they can do and the health threat to your family. This identification is essential to providing the most effective pest solution. Determine level of need: Once we determine the pest threat, we implement a prescriptive treatment program. 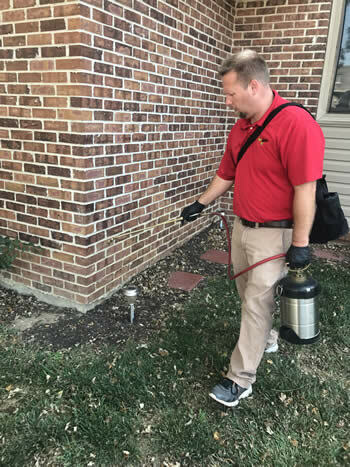 We deter pests from breaking the perimeter to enter your home, including vacuuming, sweeping, and our exterior Seal and Secure program. We then provide baiting and low-impact product applications to eliminate the current threat. Communicate: Every time we perform a treatment, we provide you with a report of what treatments were applied, and if there are any emergent conditions that would favor new pest invasions. Follow-up: We provide consistent follow-up depending on your needs and concerns. We offer several residential maintenance programs. A wood damage warranty that ensures you’re protected. To ensure your family is protected against pest invasions, we recommend ongoing pest protection programs. However, we do offer one-time pest elimination treatments upon request. Please ask your technician for a price quote.